If your chimney flue liner has sustained damage but is still largely sound, relining may not be your only option. Home Safe Hearth & Chimney, Inc. also installs HeatShield® Cerfractory Sealant, which can restore the integrity of your liner (eliminating cracks, gaps, and other voids, and repairing spalling tile) without having to replace it with a stainless steel product. Home Safe Hearth & Chimney, Inc. are exclusive dealers of this product and the only ones in the area with the training and qualification to use it. Properly installed, HeatShield® seals your flue and allows it to properly vent gases and other byproducts. This helps ensure that your chimney is as safe and efficient as it should be. 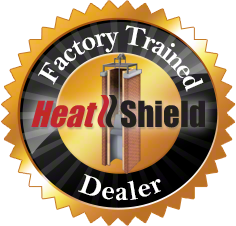 HeatShield® has also proved to be a highly-durable product, able to withstand moisture and corrosive flue gases, and temperatures reaching over twenty-nine hundred degrees. When installed by the CSIA-certified technicians at Home Safe Hearth & Chimney, Inc., HeatShield® systems also carry a 20-year limited warranty. Don’t risk your investment by trusting the restoration of your flue to amateurs – Call Home Safe Hearth & Chimney Inc. today! HeatShield® Resurfacing System – For flues that show cracking and spalling, Home Safe Hearth & Chimney, Inc. technicians will coat the entire flue, first cleaning and priming with a “tie coat,” then adding a 1/4-inch thick layer of sealant. This application will return your flue to a thoroughly-restored, smoke-tight state, and a video scan will confirm the effective installation. Do you think HeatShield® Cerfractory Sealant might be the right repair for your chimney liner? Call Home Safe Hearth & Chimney, Inc. or click here to schedule an appointment online to discuss the possibility of restoring your liner with HeatShield®! If your chimney needs relining, rely on the experienced, fully-trained technicians at Home Safe for this crucial chimney repair.